BHASVIC hosted a talk for A level Modern Language students given by Claire Cuminatto of the University of East Anglia (UEA). Students from other Sixth Form Colleges and a local Secondary School joined BHASVIC students to learn about the range of Modern Foreign Language courses offered at UEA. These include pure degrees in French, Spanish and Japanese or combination degrees such as Translation, Interpreting, Business and Law. Claire explained how some of the most specialist modules offer the opportunity to learn how to write subtitles for films and translate comic books. There is also the opportunity to study ten languages at various levels for all UEA degree students. 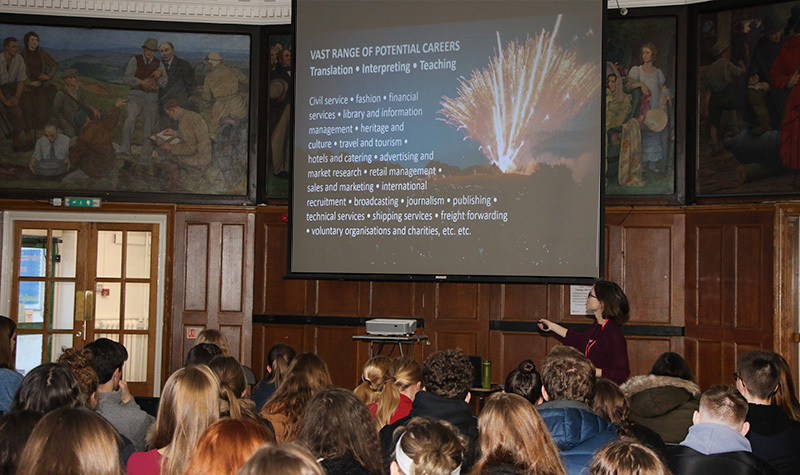 During the talk Modern Foreign language students had the opportunity thanks to Claire Cuminatto to see the range of careers pursued by graduates and to learn about the current need for linguists in our country.